The British telco bid 299 mln stg a year to show Champions League soccer. BT overpaid – but now becomes a serious player in sports broadcasting. That should help retain broadband customers, win back defectors and sell new TV services. The threat to pay-TV king BSkyB is growing. A production staff member works in the gallery during the BT Sport channel launch program at the BT Sport studio in the Queen Elizabeth Olympic Park, in east London. 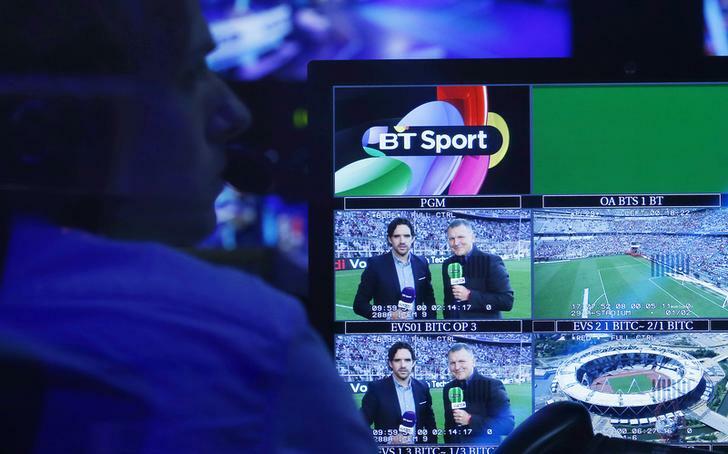 BT Group won the right to show Champions League soccer matches from 2015, replacing pay-television group BSkyB and ITV, Britain’s biggest free-to-air commercial channel. BT, Britain’s second-biggest telecoms group by market value, will pay 299 million pounds a season as the sole provider of Champions League matches on Tuesday and Wednesday nights. It will also show the second-tier UEFA Europa League. The three-year deal more than doubles the 400 million pound contract UEFA struck with BSkyB and ITV in 2011. It builds on BT’s purchase last year of 38 of the 154 live matches in Britain’s Premier League. Some matches, including finals, will be shown free-to-air, even for households who have not signed up to the new BT Sport channels. BSkyB said: “We bid with a clear view of what the rights are worth to us. It seems BT chose to pay far in excess of our valuation.” The Indepedent on Sunday and the Sunday Telegraph, without citing sources, said BSkyB had offered about 500 million pounds for its share of the rights. The IoS said ITV had bid 188 million pounds rights, while the Telegraph said the terrestrial broadcaster had bid 220 million pounds.